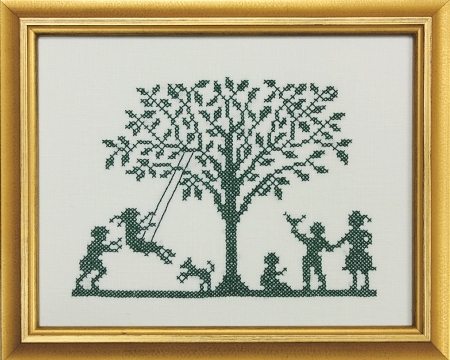 Playtime is a printed cross stitch sampler, one color,Dark Green on Ivory Linen. A stamped sampler that relates to a time when there was no Internet and Children were just being Children enjoying the fresh air and outdoors without the hectic lifestyle that is today's standard. This is a stamped cross stitch sampler that is worth giving to Grandchildren so they can reflect on their childhood. This is a very nice kit and lovely scene. I will order from this company again.